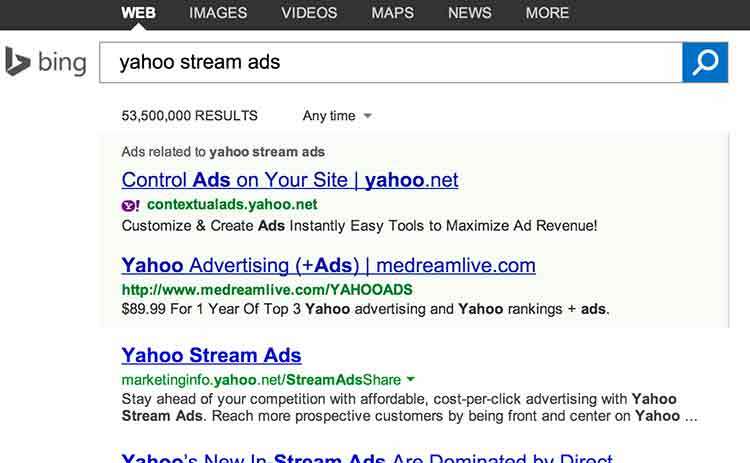 Yahoo Actually Made Money in Q1, Despite Own Search Engine. Today Yahoo announced it had better than expected profits. This is of interest to me only because of a coincidental experience I had today with Yahoo, which now has me thinking that I might just buy some Yahoo stock. I manage client advertising on Yahoo and today I was trying to log onto the Yahoo Stream Ad management system but my bookmark was missing. Perhaps I deleted it by accident during this weekend’s post-Heartbleed password and bookmark cleanup session. No worries, I went to Yahoo.com to search for the login page of it’s own advertising platform. Here is that screenshot. The Stream Ads page was nowhere to be found on the first page. Annoyed, I didn’t look further on Yahoo. Next up was Bing, which shares technology with Yahoo and seemed another logical choice for locating a Yahoo product. Bing didn’t bring home the winner on the first results page either. How tough can this be? Next up, Google. Thank you, Google. Result number one on the first page is the right answer, and Google continues to earn it’s reputation as a superior search engine. 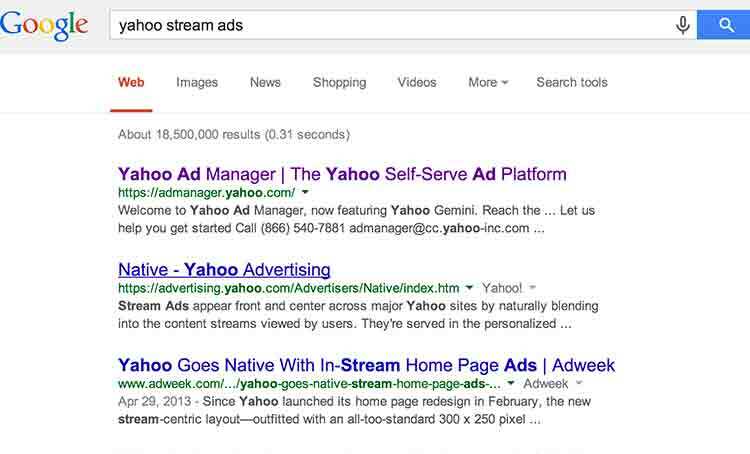 This Google vs Yahoo vs Bing contest was no contest. 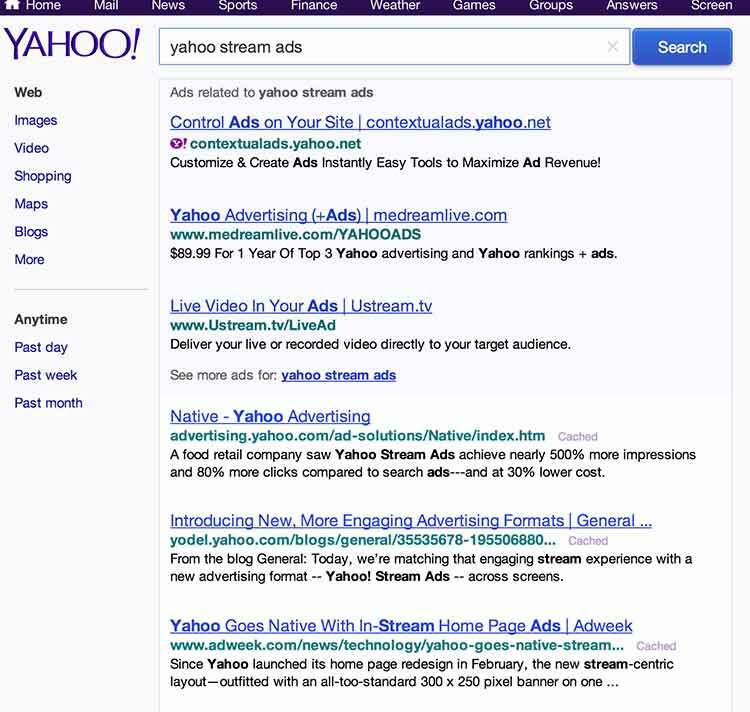 If Yahoo’s search engine technology is as shabby as this real world example demonstrates, why would I buy Yahoo stock, you may ask? In the earnings call, Yahoo CEO Marissa Mayer said they hired “300 talented engineers” last quarter. My reasoning is that if they made money with that fail of a search engine, imagine what they can do once these talented engineers properly index their very own products. Then again, I do have that rule about never buying stock in a company whose products or services I personally do not use and recommend.